On Oct. 31, we celebrated the 500th anniversary of Martin Luther nailing the 95 Theses on the door of his church in Wittenburg, Germany. Alan Gomes, professor of church history at Talbot School of Theology, explains some of the most important parts of the legacy of the Reformation for today. 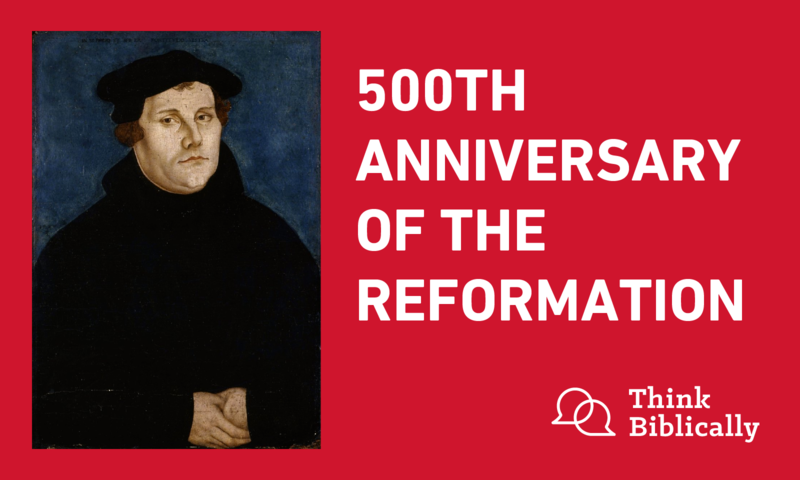 Listen in as Scott Rae and Sean McDowell interview Alan on the relevance of the Reformation for today. Dr. Alan Gomes is Professor of Church History at Talbot. He specializes in the history of Christian doctrine and in the theology of American religious cults. Gomes is series editor of the 15-volume Zondervan Guide to Cults and Religious Movements, and wrote three books in the series: Unmasking the Cults (the introductory volume to the series), Unitarian Universalism and Truth and Error: Comparative Charts of Cults and Christianity. He also edited an updated edition of W.G.T. Shedd's Dogmatic Theology (Presbyterian and Reformed Publishers, 2004). He has contributed articles to numerous journals, including Westminster Theological Journal, Trinity Journal, Presbyterion, and Christian Research Journal. Gomes has spoken at churches throughout Southern California and has been a featured guest on radio shows across the U.S.
Sean McDowell: Welcome to the podcast Think Biblically: Conversations on Faith and Culture. I'm your host, Sean McDowell, a speaker, author and apologetics professor at Talbot Theological Seminary, Biola University. Scott Rae: I'm your cohost, Scott Rae, Professor of Christian Ethics, also at Talbot School of Theology at Biola University. We're here with Professor Alan Gomes today. Dr. Gomes is Professor of Historical Theology at Talbot, has been for some time. He's a specialist on the Reformation. In fact, we tease him at Talbot about spending his academic career studying dead theologians, which he does not deny. Alan Gomes: No, I don't. Alan Gomes: Proud of it. Scott Rae: This is a big year for the Reformation. It's the 500th anniversary of the Reformation when Luther nailed the 95 theses to the door of the church in Wittenberg, Germany and, Alan, we're delighted you could come be with us to help us explore, for our listeners, a bit further, some of the legacies of the Reformation, some of which we've held onto pretty well, and maybe others that we've held onto not so well. Scott Rae: So first, tell us, what are some of the most common misconceptions that you think people have about the Protestant Reformation? Alan Gomes: Well, I think that one of the most common misconceptions is that the Protestant Reformation was fundamentally a kind of revolution, in other words that it turned everything upside down. Actually, the Protestant Reformation made only a couple of course corrections, but they're very important course corrections. So on the one hand, we don't want to overstate the differences. There's massive continuity, actually, between the Reformation and the Christian tradition taken as a whole. But nevertheless, the two issues on which the Reformation turns, really, is the question of authority. So, what is the source of authority in the Christian life — the source of authority for theology? And then the other question is, how is it that the saving work of Christ actually comes to apply to any particular individual, to you and to me? Those are the two issues, and they're hugely important issues. But we should also realize that in terms of the doctrine of the Trinity, the person of Christ, even the doctrine of Scripture as far as being authoritative and the Word of God -- these are all things that the reformers had in common with their Roman Catholic adversaries. Sean McDowell: So is it accurate to say that the Protestant Reformation is not bringing in new ideas but bringing us back to the ideas taught by Jesus, and Paul, and the very first followers of Him? Is that fair, or is that too simplistic? Alan Gomes: No, I think that's fair. The reformers are looking back to the sources; “ad fontes” is kind of one of the battle cries of the Reformation. And so not only in this period is there a rediscovery of classics and other kind of literature, but there also is greater attention given to biblical studies, to going back to the New Testament, and then comparing the practices of their day with practices that they see as normative in the Bible. Sean McDowell: We're going to come to some of the practical applications of the Reformation for today, but can you give us like a thumbnail summary of some of the main themes that characterized the Reformation? Now, people often express these in terms of solas of the Reformation. What are these solas, and explain them in simple and concise terms, so us non-theologians and historians can get them? Scott Rae: Our listeners, I think, also need to be aware that Dr. Gomes teaches virtually a whole semester course on the Reformation. Scott Rae:: So, he's trying to summarize what he does in a whole semester here in the next, you know, three or four minutes. Scott Rae: Good luck with that. Alan Gomes: Yeah, I know. Sean McDowell: Give us your Twitter version. Alan Gomes: My Twitter version. Well, I think the Reformation solas are a reasonably good way to condense it. And what the solas are, are essentially two, and in one case, three-word Latin sound bites that capture the main themes of the Reformation. Let me just list them off and then say a couple words about each one. So we've got Sola Scriptura, the Bible alone. We've got Sola Gratia, grace alone, or by grace alone. We've got Sola Fide, by faith alone, and then we have Solus Christus, Christ alone, and then the fifth one is Soli Deo Gloria, which would be glory to God alone. Okay? Now, Sola Scriptura means that, and this is Luther's teaching, as well as any of the reformers, all the mainstream reformers this is so. The Bible is not just one source of authority for the Christian. The Bible is the source of authority for the Christian. And so this has to do with all matters of faith and practice, for how we construct our theology, the Bible is the sole, and sola, source of authority for the Scripture. Now, this contrasts with the Roman Catholic view. In the Catholic view, Scripture is authoritative, Scripture is inspired; however, for them it's Scripture, plus tradition, and then the third leg of the stool is as interpreted through the teaching magisterium of the church. The reformers say, "No, it's not tradition, and it's not the church, but it's the Bible, and the Bible alone, and what it teaches is authoritative.” So that's Sola Scriptura. And then Sola Gratia means we're saved by grace alone. Now, actually just taking that on its face, the Catholics would agree, "Oh, yeah, salvation is by grace alone, but that's because God graciously allows us to be able to earn merit.” Now, this is kind of a contradiction in terms, and that becomes clear when we look at Sola Fide, that the way in which salvation is appropriated by the individual is by simple faith alone. The Catholic position is that we're saved by grace, through faith plus works. The Reformation position is that we're saved by faith. Full stop. Okay? Then, of course, Solus Christus is clear enough, that salvation is by Christ alone apart from any other mediators, whether it's Mary, the intercession of the saints, the Pope, Christ plus the church. No, it's Christ. Christ is the sole Savior, and that's it. And then, of course, as a result of these things the glory goes fully to God. Soli Deo Gloria means glory to God alone. He receives the full glory for everything accomplished in our salvation. Scott Rae: Okay, thank you. That's really a helpful, I think, thumbnail sketch. Alan Gomes: Was that short enough? Scott Rae: That was, no, that was excellent. Sean McDowell: Hey, you nailed it. Sean McDowell: Did you get the pun? Let's make sure. Alan Gomes: I got the pun, though some say Luther may have posted it with a pot of glue, or that somebody else besides him may have posted it, but we won't get into that. Alan Gomes: [crosstalk 00:07:15] The posting of the 95 theses. Scott Rae: [crosstalk 00:07:15] The posting of the 95 theses. Scott Rae: Tell our listeners a little bit more about that event. Scott Rae: You mean that's not how it worked? Alan Gomes: No, that's not how it worked. So really, there were a lot of factors at play, a lot of political factors, economic factors, religious unrest, a lot of things going on. So it's not really true that Luther just brought in the Reformation by sticking some paper up on a door. The fact is, Luther was more surprised than anybody else that the 95 theses represented a kind of tinder box that set off this Reformation. You have to understand, these were theses, in other words propositions neatly numbered, technical propositions, that were designed for academic debate. The way in which education was done in that period, and even for hundreds of years before, and for quite a long time after, is that people working on degrees would essentially have to argue their way out of the school in getting the degree. So it was a pretty rowdy system, actually. But these were academic theses written in Latin, no less, so the common people wouldn't be able to understand them, and they were designed for technical academic debate. So, in doing this, this was not like an act of vandalism, or something. You have a bulletin board, you're posting theses for academic debate, and this is just done all the time, and Luther wasn't doing it to ignite a powder keg. He was as surprised as anybody else. Now, what happened, and here we get to the fact that other factors have to happen besides Luther just dropping down out of the sky. We have this thing called the printing press that isn't too long, kind of the internet of its day, and people copied these theses, translated them, and started distributing them broadly. And so now, people are looking at this and saying, "Whoa, we've got some problems here." They knew there were problems, of course, but I mean it sort of put voice to some of these things. But actually, when you look at the 95 theses, and we won't take the time to go through them, but just, in general, they're relatively mild and pretty deferential to Catholic teaching, just singling out the worst abuses. So really, Luther didn't think he was doing anything particularly radical, and they had a much greater effect than he would have envisioned happening. Scott Rae: It would be fair to say that he was pretty well caught off guard by the response that they got? Alan Gomes: I think that's fair to say. It definitely wasn't the response he was thinking would happen. Sean McDowell: Can you tell us a little bit about Luther, just the kind of person that he was, maybe his life background, that would motivate him to do this at this stage in history, and in his life? Alan Gomes: Well, boy that's a complex question. Luther was certainly somebody who loved truth, and then you also have to look at, in understanding Luther, and in this sense he reminds us a bit of Saint Augustine, who is a model in many ways for the later reformers, and that is that his spiritual pilgrimage, or let's put it this way, his theology in some ways is a reflex of his religious life. Here is a person who is going through tremendous angst, spiritual angst, striving to have peace with God. And this whole indulgence thing fits. We can't untangle right now all of the pieces of this, but you can see how it relates to a doctrine of grace versus a doctrine of merit, a God who saves freely as opposed to a God who requires works, this kind of thing. So Luther is deeply struggling with these things, coupled with the fact that as a professor of Theology, and when he took his vows, he believed that he had an obligation to stand up for, and defend the truth. So there's a number of things in his personality and in his spiritual background that would lead him ... And he was quite fearless, actually. He wanted to debate these things, and get a hearing, and to really explore it all the way to the end. But at the time, again, that he posted the theses, there was no thought, in fact there never was a thought, that Luther wanted to break away from the church and start some kind of denomination, right? He was given the left foot of fellowship when Pope Leo X excommunicated him with the bull Exsurge Domine that booted Luther from the church. So he was a son of the church. He wanted to reform the only church that he knew, but he felt these issues, and as his studies of the Word of God, particularly his studies in the book of Romans, convinced him these were crucial things that had to be addressed, and he was going to address it. Scott Rae: Let's go back just a minute to a couple of these Solas. Scott Rae: Grace alone and faith alone. It seems to me one of the most important legacies of the Reformation is that re-affirmation of salvation by grace through faith alone. But one of the practical implications seems to me that we need to address is that, if salvation by grace is true, as the reformers ... as the Bible taught, and as the reformers resurrected. Scott Rae: If Luther's teaching on this is true, how does this keep the Christian from becoming something akin to a spiritual couch potato? Scott Rae: ... by way of service, or works? Alan Gomes: Sure. Go ahead, Sean. Sean McDowell: I've been asked this question by Muslims and Mormons, so it gets to the heart of how we practice out our faith. Alan Gomes: Sure, sure. Yeah, Mormons have a word for people like us, that is to say Protestant Christians. We're gracers because, "Hey, you think that you're saved by grace, so you can just break the commandments of God." First of all, Scott, you're right in saying that the doctrine of justification by faith is a critical doctrine for the Reformation. Luther himself singled out that doctrine as the doctrine on which the church stands or falls. So obviously he thought that was pretty darn important, to single that out: justification by faith alone. Okay and secondly, the charge, as you've kind of summarized it, was brought against Luther's doctrine from day one, and it's still brought against Luther's doctrine, and really this is just classic Protestant theology on salvation by faith alone, so it's not just Luther, but certainly Luther. It's continually brought against us today. “So what's the response to that?” is what you're asking. Well, actually it might seem to some paradoxical, but it isn't when you look at it, that Luther's doctrine of justification by faith alone not only, not only does not turn us into spiritual couch potatoes, but actually furnishes the strongest basis of all for doing works in the Christian life and, in fact, doing works that actually count for something, that's the key thing. It really does. You want me to tell you how? Scott Rae: [crosstalk 00:14:51] I'm on the edge of my seat here. Come on. Alan Gomes: You're all ears. Alan Gomes: Okay, okay. I'll get there. Okay, so here's the thing. In the Catholic system, in which Luther's having this great spiritual struggle, a person who is really serious about the salvation of his or her soul would have a religious calling. They would go into a religious calling or vocation, right? And the idea was, given the Roman Catholic doctrine of merit, if you spend full-time trying to rack up merit by praying all the time, and attending masses, and venerating relics, and doing all of these kinds of things whereby you could rack up spiritual brownie points, then, of course, the more merit the greater the chance you have of pleasing God, and of securing a high spiritual estate and status for yourself, right? Well, now, if Luther's doctrine of justification by faith is true, and you're accepted by God purely by faith alone, and as accepted as you're ever going to be by faith alone, then, obviously, you don't have to spend your time trying to coax a holy God into thinking that you're good enough for a place in heaven. I mean, the average work-a-day person who's dividing his or her time milking cows and changing diapers, well they can gain some merit because they can go to mass and observe the feast days and the like but, really, just simple math tells you that if you're spending 24/7 racking up merit you can get more merit than if you're dividing your time with worldly pursuits, right? So of course, Luther's doctrine completely, which is the Bible doctrine here, let's understand this, completely does away with this, right? You're accepted by God as a free gift by faith alone in Christ alone. Now, what Luther points out though, is that although God doesn't so-to-speak need our works in order to save us, and that we don't need to do works to cajole, rather, a holy God, guess who does need our works? Luther asks. Our neighbor. Our neighbor needs our works, and so the fact that we are fully accepted by God, on the basis of faith, frees us up to go into the world and to serve people through acts of love, because our neighbor needs us to unclog her toilet, or to help with meals when he's sick, or to give a word of encouragement when she's down. See, these kinds of things are ... Whereas, you see, if you're spending your time cloistering yourself away in a monastery and trying to rack up all these brownie points with God. Well, that's time you're not spending helping somebody who needs your help. And you see, this is ... I've got a good quote from Luther in front of me. I'm gonna give this one to you for free, how about that? Scott Rae: What a deal. Sean McDowell: I know, what a deal. Alan Gomes: I won't even charge you for this one; the others, well... Okay, he says, "The Christian life does not consist of what such men as monks invent. It does not drive people into the wilderness or cloister. It is Satan who commands you to forsake men." I mean, come on, Luther, don't beat around the bush, what are you really thinking? "It's Satan who commands you to forsake men. On the contrary, the Christian life sends you to people," notice this, "to those who need your works." So works become necessary in the Christian life. They are necessary in the Christian life, because that's how we serve other people, not through some man-made kind of piety by which we think we can impress a holy God. Sean McDowell: … at different stages in his life, but does that help the point you made to reconcile how he saw salvation in Paul compared with James, or how would he make sense of that tension? Alan Gomes: Well, I'll tell you how I make sense out of that tension. Luther did have some problems with James, and I think that's because he perhaps misunderstood what James was getting at, at that point, and he thought James maybe tended to harp on the law, or something like that. The Lutheran church, by the way, doesn't follow that position. The later Lutheran theologians are very, very clear about that. Yeah, as for the discrepancy between James and Paul, there's no discrepancy because, although James says we're justified by works, and Paul says we're justified by faith, and they use the same word justify there, there's a range of meaning for what the word justify has. So Paul is talking about being declared righteous by an act of God whereby we stand before the bar of God's justice vindicated. God regards us as having met His law, and this happens entirely, solely, Sola Fide, by faith alone, right? James, rather, is talking very clearly of justification as to show to be righteous. In other words, here the idea is demonstrating the reality of faith through works. And bringing it back to our question of vocation, one way in which we show the transformation that God has done in our heart, by grace alone, through faith alone, is how we treat other people, how we put their needs above our own, and how we seek to fulfill our vocations in serving people. Scott Rae: So this is what Luther meant by the term of the “worldly calling”? Alan Gomes: Right. So in other words, Luther believes there are people who just do their work-a-day jobs without any reference to God, but for the Christian Luther is very clear that our calling is something that we do to bring glory to God, that there's more to it than just earning a salary. Now, there's nothing wrong with earning a salary. When Luther can speak of our outward station in life, our calling in terms of being ... By the way, we have multiple callings. It's not like we only have one calling. Flagellating yourself with a whip, as Luther did to himself in the monastery, and different things like that. It's actually a lot simpler than that, and people can spiritualize it, and make it complex, but it really is that God works in our lives, and through us into other people's lives, through the day-to-day callings in which we find ourselves. Scott Rae: So would it be fair to say that Luther, and the other reformers, changed the way the church viewed the dignity of every-day, ordinary work? Alan Gomes: Yes. Well, certainly it changed the way Protestants viewed it, maybe not everybody was sold. But sure, because in the classic traditional view, — and you can look at Thomas Aquinas, for example, and what he says about religious callings — clearly the people who were thought to have a calling are the ones who are called to religious orders, right? So if you are called to be a monk, or maybe a priest, or something like this. Well, these are people that have a calling. The other people, well they have jobs, and they got to do it, you know. Scott Rae: We may need to edit that part out. Alan Gomes: You'll have to edit that out, yeah. But seriously, and you know, the thing is we have to beat it out of ourselves, because we can easily lapse into this idea of thinking that, "Well, if I'm leading a retreat, or doing a podcast about something religious, like Luther, or teaching a woman's Bible study, or whatever it may be, that that's spiritual, but when I go home and change diapers, or take my kids to soccer practice, or work as an accountant solving somebody's tax dilemma, well you know, then I'm not doing ministry." No, no, no, we got to get rid of that. I think Luther gives us the tools ... Well, the Bible gives us the tools, but he helps us to see what the Bible shows us about these things. Sean McDowell: That is such an important point. I've been working with students, like high school students, for decades, and I found one of the greatest reasons they fail to live out their faith is this compartmentalization, that I have my spiritual life over here and my secular life over there. So bridging that gap, I would argue, is one of the most important tasks in the church today — professors, pastors, and parents. Thank you for drawing that out. Last quick question then we'll wrap up. Sean McDowell: If you were gonna recommend one book, and it's got to be one book, not an academic book, either a beginning, or kind of intermediate book, for our audience just to understand the Reformation, and maybe why it's important, what would be that book you would recommend? Alan Gomes: Oh, wow, you're gonna make me recommend one book. Well, on the question of vocation, since we spent a fair amount of time on that, let me say that if it were a popular level book that would the very good, and I think this is such an important issue, and it'll give you some broader insights on Luther, as well, Gene Edward Veith; it's called God At Work. A more technical one is by Gustaf Wingren called Luther on Vocation, but it's pretty technical, and I don't know how many people would want to slog through that. Then, on the Reformation solas, Matthew Barrett for a recent ... There's tons of books on this, but Matthew Barrett has come out with a recent volume on this within the last, I don't know, year. I don't remember the date, but very recent. That would be a good one to go to. Scott Rae: I knew he couldn't limit himself. Alan Gomes: All right, all right, all right. Scott Rae: I knew it. Alan Gomes: This is a rough crowd. Sean McDowell: Professor Gomes, thanks so much for coming on and, even more importantly, just the work you've been doing for decades, writing, and teaching on this. It's so, so important.